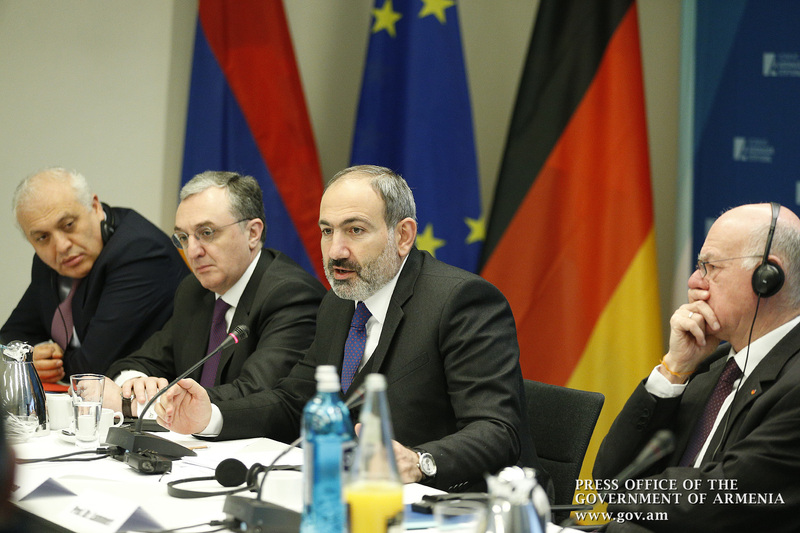 Prime Minister Nikol Pashinyan is paying an official visit to the Federal Republic of Germany. 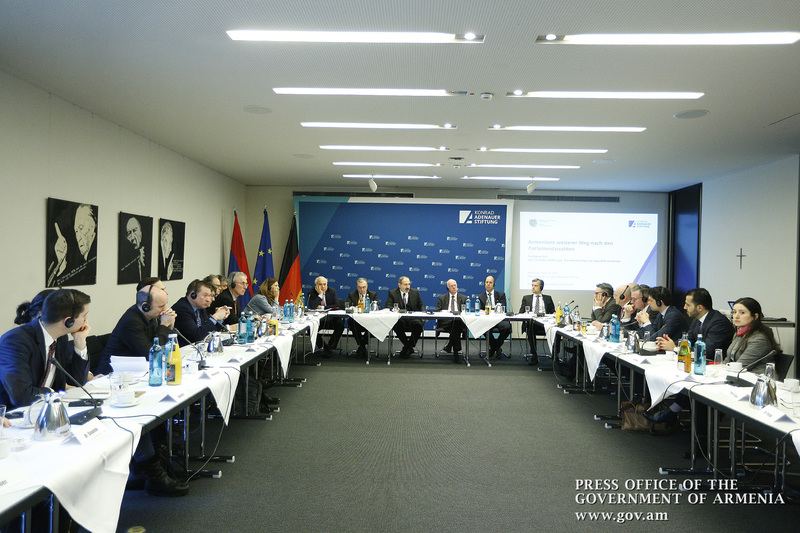 Today, the Prime Minister of the Republic of Armenia is scheduled to meet with the top German leadership in Berlin. 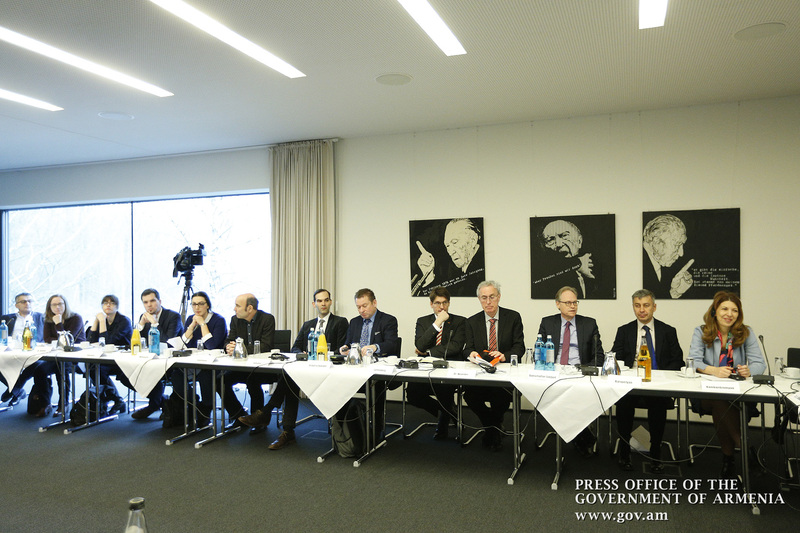 Before that, on February 1, the Prime Minister visited the Konrad Adenauer Foundation in Germany, where he was welcomed by President of the Foundation Norbert Lammert. 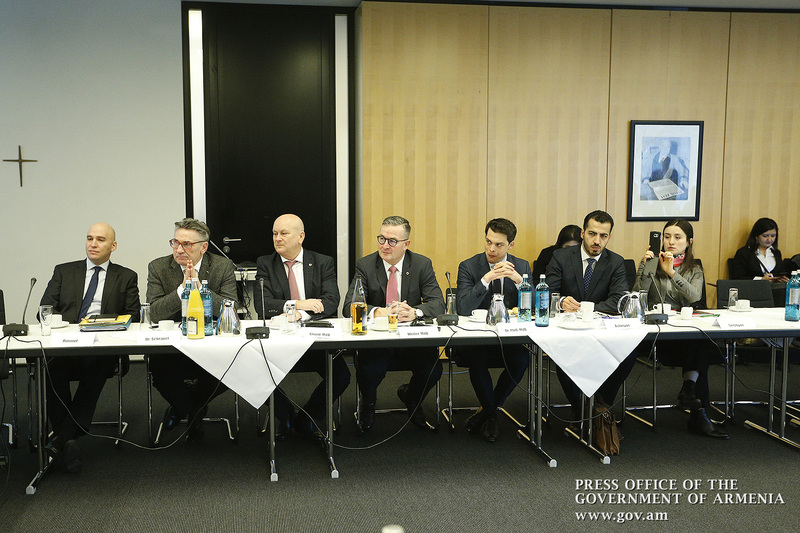 Representatives from the German Bundestag, German Chancellor’s Staff, German political and public circles were in attendance. I am glad to be hosted today by the leading German political foundation within the framework of my first official visit to your country. Principles of freedom, justice and solidarity have been placed at the core of the activities of the Konrad Adenauer Stiftung, and I am honored to be speaking here, viewing this somehow as a symbolic and momentous event. 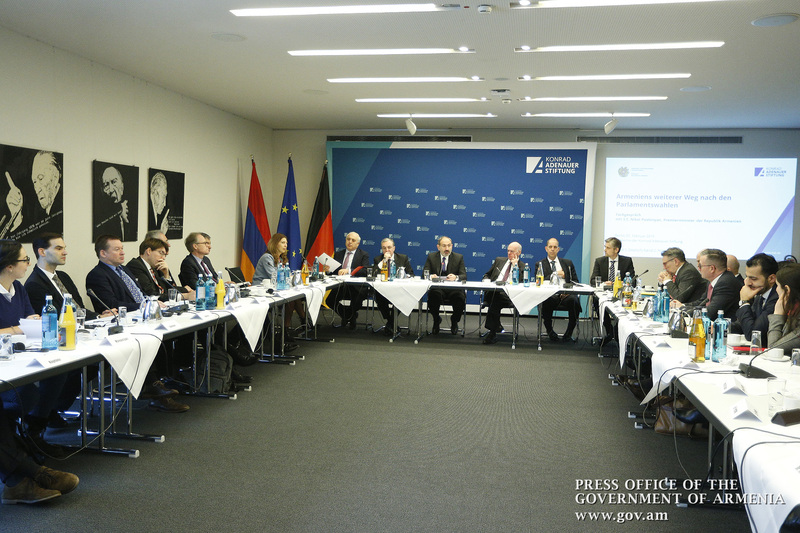 It is symbolic because, today’s Armenia, like Germany seven decades ago, is experiencing a democratic reconstruction. It is symbolic because the velvet revolution, which took place in Armenia last year, was built on the ideas and principles promoted by the Foundation. Last year historic changes happened in Armenia. We restored democracy which has been abused and distorted since the times when we rose in a nation-wide popular movement against the communist regime. Today, I am proud to declare that democracy is no longer endangered in Armenia. The logical pinnacle of these positive developments was the snap parliamentary elections held in last December. They were assessed by the international observation missions as consistent with international standards, and hailed as democratic, free, fair and transparent. As a matter of fact, they were the only uncontested elections ever conducted in Armenia since the elections held in 1991 - just on the eve of the collapse of the Soviet Union. The recent elections reinforced our achievements and proved that our people do not see any alternative to democracy. Political forces representing new Armenia won a landslide victory. The forces representing the former elite were overwhelmingly rejected. The Armenian voter denied those, whose names were associated with corruption, restrictions in exercising fundamental freedoms, poor governance, economic inefficiency and stagnation. Instead, they casted their ballot for a deep transformation, and a society based on the rule of law and an accountable governance. In recognition of our democratic achievements, the “The Economist” declared Armenia as the country of the year. Today our Government has an unprecedented level of legitimacy and public trust. According to one of the recent surveys, more than 70% of our public are confident that the country is going in the right direction. On the one hand, this unprecedented level of trust obliges us to take decisive steps towards the reforms. In this task we have no right to fail. On the other hand, the public trust provides for a unique opportunity, which we have to use for strengthening our achievements and protecting the future of democracy in our country. On this point, we believe that as the next step in the transformation process we should translate our political achievements into economic growth. In other words, we have to make an economic revolution. Democracy and economic development have a strong interactive relationship in our society. The Economic revolution and elimination of poverty are the priorities of our people. This idea constitutes the main premise of the Program of our new Government. How are we going to achieve that goal? The answer to it is very simple but yet not that easy to achieve. We see the establishment of conducive environment conditions for a free and unrestricted realization of the business and intellectual potential of our people as one of the main prerequisites. 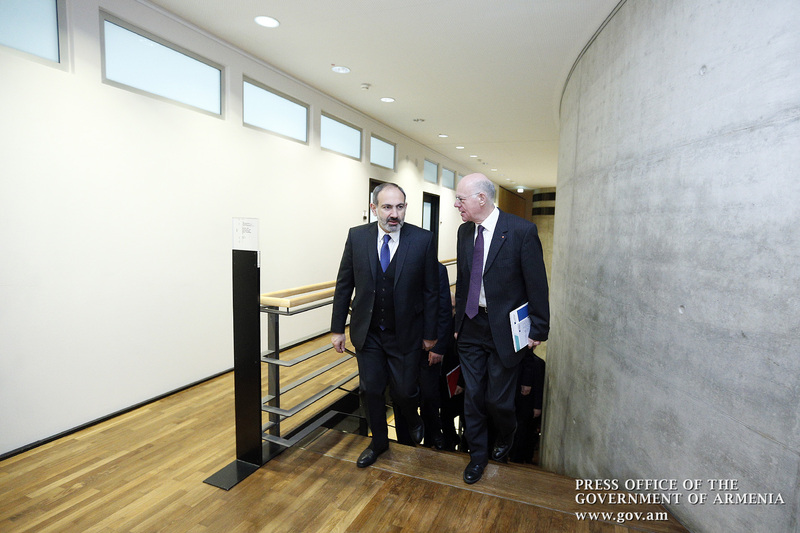 We have adopted and already started implementing an ambitious reform agenda to this end. In particular, we are currently taking drastic measures to fight against corruption, eradicate monopolies, establish level playing field for all economic and political actors, and strengthen independent judiciary system. In order to succeed in implementing these reforms we are developing our economic and political institutions. Changing institutions is a difficult process for any government and society. It requires significant resources – both financial and intellectual. We are determined to move forward on this path. However, like any other country in transition we need assistance in accelerating the pace of the reforms. In this context, I would like to bring to your attention a well-known fact that none of the countries of the former soviet bloc has so far succeeded in modernizing institutions without financial and technical support. Armenia is not an exception. Moreover, in addition to the challenges typical for the post-communist countries, Armenia, since the very first days of its independence, has been facing several other challenges. Being a landlocked country is a geographical handicap, but facing almost a thirty-year long imposed transport blockade, is a deliberate political move against our country with serious and sometimes insurmountable impediments for its economic development. Energy security is another issue for us. And finally, legacy of the past creates an unfriendly security environment and uneasy geopolitical situation which in some circumstances can grow into an existential threat. 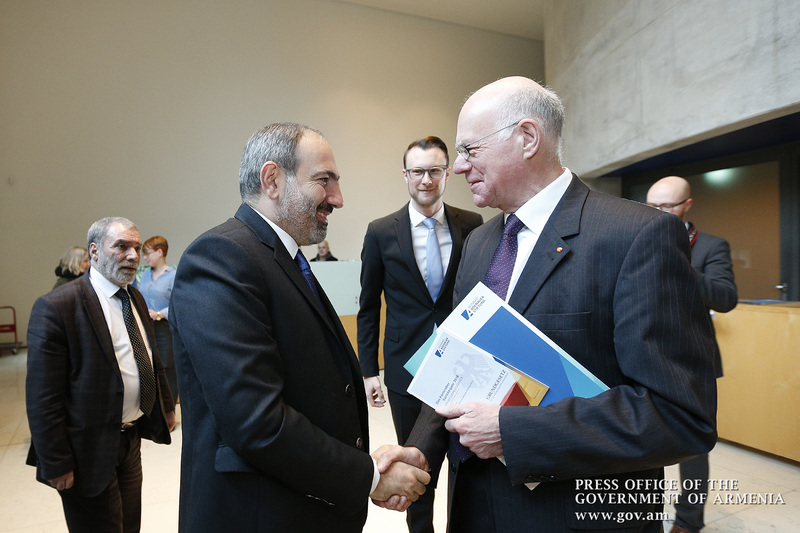 In this respect, partnership with the European Union is of an immense importance for Armenia and our reform agenda. It is hard to overestimate the significance of the EU support, which have been provided to Armenia over the last quarter of a century. As I stated above, we are determined to move forward in the realization of our reforms. We will do it regardless all difficulties and unforeseen circumstances. However, the EU financial and technical assistance could accelerate the processes undertaken in Armenia, and make them more robust and instrumental. Here, I want to emphasize the importance of the Comprehensive and Enhanced Partnership Agreement (CEPA) with the European Union. Its implementation can immensely contribute to the development of our institutions. CEPA is, in fact, tailored as a development strategy plan for our country and could become one of the cornerstones of our reform agenda. 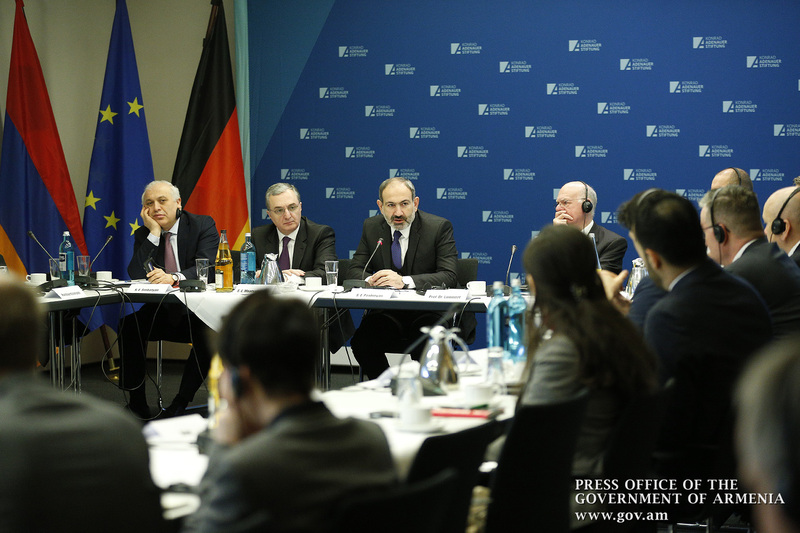 With the same view in mind, we want to deepen our economic relations with the EU member states. 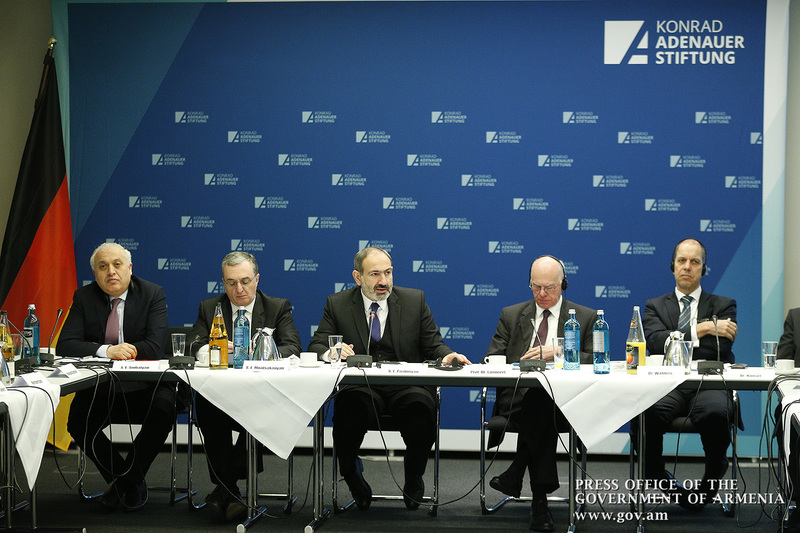 Germany itself is one of our major donors and main trade partners. We are working together in numerous areas, including, Information Technology sector, energy, tourism, culture, education, science… - you name it. We are strongly committed to strengthening our ties and exploring new prospects for economic cooperation. 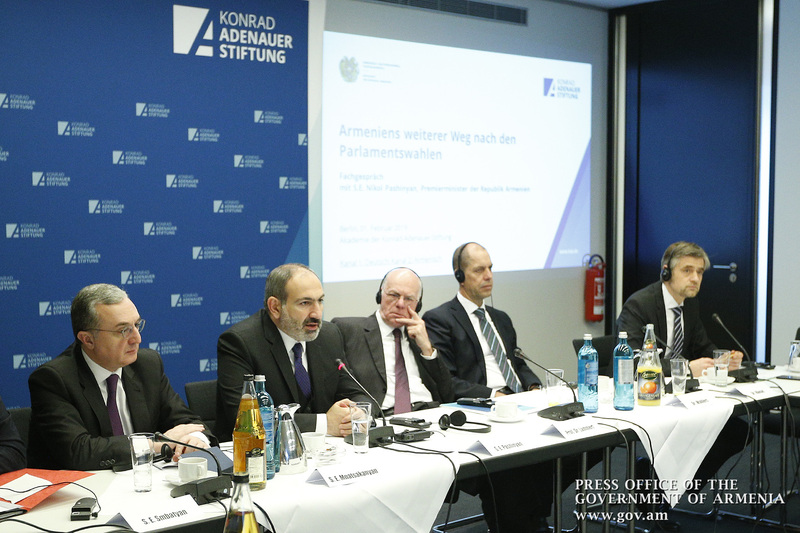 New democratic Armenia opens wide opportunities for trade and investments. In addition to the robust institutional reforms currently underway, we have some other advantages, too. Armenia is a member of the Eurasian Economic Union with an unrestricted and unimpeded access to a 180-million strong market and free trade agreements with several countries worldwide. At the same time, we have a GSP+ trade regime with the European Union that very soon, as I stated, will be complemented with the CEPA implementation. This important fact constitutes one of our main comparative advantages: Armenia could play a role of an economic bridge connecting the markets of the European Union and the Eurasian Union. Speaking about the perspectives of our economic cooperation I would like to highlight that the technology sector is rapidly growing in Armenia and the pace of that growth is unprecedented. Over the past seven years, the sector has grown fivefold. IT sector is becoming one of the driving forces of our economic growth with an enormous potential for further development. Traditionally strong school of mathematics, physics, and engineering existing in our country since the USSR is mainly accounting for Armenia’s success in this area. However, I am also confident that the Armenian revolution, which created conditions for an unrestricted realization of the talent of our people, will significantly contribute to the development of technologies in our country. I believe that freedom and the spirit of creativity and innovation are interconnected. New Government of Armenia has declared the Technology sector as a top priority and we see it as the locomotive of our economic revolution and the cornerstone of Armenia’s economy of future. I want to conclude my speech by reiterating that cooperation with the EU and its member states is of a vital importance for democratic Armenia. At the same time, I believe that Europe, in s turn, is interested in having a stable, democratic partner in the volatile region of the South Caucasus - an economically developing and progressive Armenia, sharing the common European values. During the question-and-answer session, the Prime Minister presented the democratic developments in Armenia, the reforms underway in different spheres, the work carried out as part of the ongoing fight against corruption, the steps taken to implement an economic revolution, issues related to the Nagorno-Karabakh conflict settlement process, etc.